A Sea / D Sea. 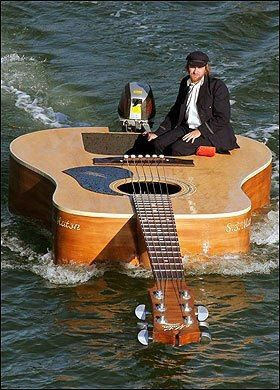 In spite of losing everything he had, the incredible shrinking man simply refused to give up his guitar. One has to be careful not to rock the boat too much. Going across the channel in that? Well, he's plucky, I'll say that for him. Hey mate, do you know how far is it to the other side? He's a Pirate he's after your Lute. Does Ed Sheeran really want to "Make It Rain"? In memory of the Thames-tations. I found a guitar on Amazon. Seasick Steve: the early years. The launch of the new "Don't Fret!" music streaming service.